Video clip synopsis – John Curtin’s journalistic instincts came in handy during World War Two when he kept the media onside with secret press briefings. He wore his AJA badge every day he was in office. Broadband MP4 curtin_bb.mp4 (18.1MB), suitable for iPods and computer downloads. 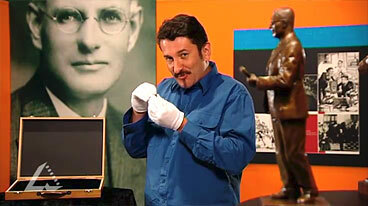 John Curtin’s Australian Journalists’ Association Badge is an episode from the series The Prime Ministers’ National Treasures, produced in 2007. John Curtin started out as a copy-boy on The Age, working his way up the ladder via the union movement. He joined the Australian Journalists’ Association (AJA) in 1917 and was elected Western Australian President in 1920, before moving into politics. Twenty years later he became Australia’s fourteenth Prime Minister. Curtin became Prime Minister in October, 1941. Many Australian troops were fighting in the Middle East and north Africa, and the others were based in Singapore. In February 1942 the Japanese took Singapore, with 30,000 Australian troops becoming prisoner. Australia seemed vulnerable to attack and even invasion. Curtin now moved to bring the Australian troops home from overseas, but British Prime Minister Churchill wanted to deploy them to Burma. Curtin fought against this, and won — but had to endure the anguish of knowing thousands of Australians were virtually without protection against a strong Japanese fleet as they made the return trip to Australia. And at the same time he had to stop Australians on the home front from panicking — and that meant controlling the news that the press would release. How could he do this? Curtin’s affinity with the press served him well during these arduous years of World War 2, when he kept newspaper editors onside with regular press briefings, even revealing dispatches from British Prime Minister Winston Churchill. He wore his AJA badge every day he was in office. John Curtin (1885-1945) was Prime Minister of Australia from October 1941 to July 1945. John Curtin’s Australian Journalists’ Association badge is held at the John Curtin Prime Ministerial Library in Perth. For more photographs, cartoons and other historical images of this Prime Minister go to the National Library of Australia and search using the Prime Minister’s name.